San Luis Rey Road Race poses a challenge for many racers not only to compete, but to finish. San Luis Rey is a 104 mile road course in which the field races 7 laps out and back through the scenic countryside of North County San Diego, between Vista San Marcos and Temecula. The temperature was on the high side of moderate but the usual dryness of the air keeps you thirsty all day. Four hours of racing out there will certainly leave a salt trail on your backside. Although the 3.3 mile power-climb softens riders all day, the lower rolling section of the course is usually where the attention is needed most. I am happy to write on this fine post-race-day Sunday, however, that one rider did not find this course, or its conditions overly difficult or out of the ordinary. This rider rode his bike just ten minutes down from his home outlook on Gopher Canyon to claim what was his on Saturday: a Victory for himself and his team at San Luis Rey and the first win of the season for SoCalCycling.com. 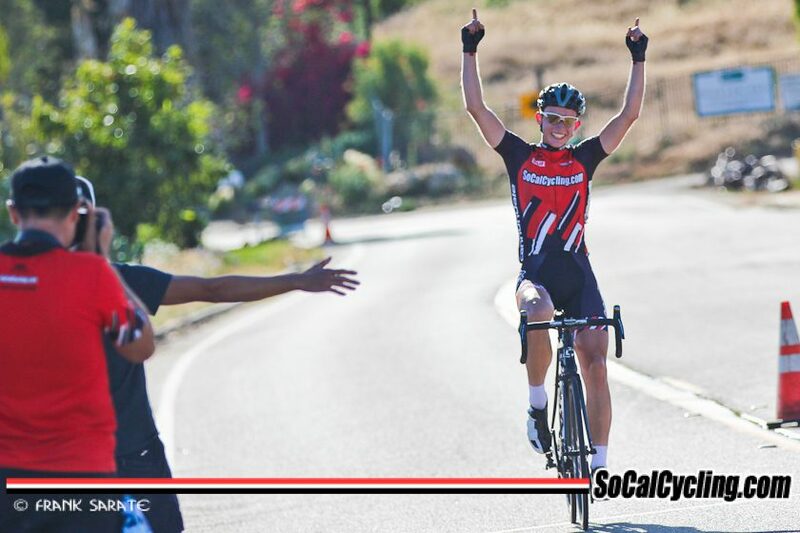 Congratulations to Innokenty Zavyalov, my teammate and friend, for his first win of the season and congratulations to us, the SoCalCycling.com Team, for our contributions in our own victory (and Elite Road Race Championship title). The turnout was nice this year with approximately fifty riders starting and heading down Lilac. With five teammates representing our SoCalCycling.com Team and a target on Inno as a recently-known strongman, we knew that we would be looked at to the control the race. We were up for the responsibility and it was our plan to do neither too much or too little but simply to keep the race within our grasp. We set out to chase significant moves up the road and represent ourselves until later in the day when the field was more vulnerable for our heavy hitters. It didn’t take long for Garrett to reach the first move of the day as he sprinted into a four-man break immediately after the race started. This was key for us early as it took pressure off our team for approximately two laps, allowing Sergio, Quinten, and myself to cover any important bridge efforts and gave us the time to check the general demeanor of the field. At the end of the second lap, two riders had caught the break and pushed-on to form their own lasting move that would begin to extend for several laps. Mario from EP Cyclists and Colton from Guttenplan Cycling (3rd place) rode well and pushed the break further and further up the road and it was on the way down into the fourth lap when our job began in controlling the race. The main field was already becoming complacent as bridging efforts from individuals were of no use and others were looking out for their best finish, surely. I was ready to man the front with Sergio and start racing to maintain these riders up the road. Sergio and I maintained our tempo and control of the field, mostly through the lower section of the course. We managed to stay intact with the field through the next few climbs and on lap 5 we brought up our tempo about as much as we could handle, knowing that we wouldn’t be surviving another climb. The break still had two minutes on us but we knew that was perfectly manageable for our strongman with approximately 40 miles to finish. I took over the pace just before the climb and pushed as hard as I could to bring Sergio, Inno, and Quinten into the pitch in good position. Sergio took over the climb after that and did his dance in order to keep the field honest. After that climb, Sergio and I became audience members, looking on to see what would become of the field and the break. I continued to ride with full intention of finishing and continuing to watch the riders in contention on the road. I was curious to see how the [two] breakaway riders would continue, as they still had a two minute lead when I departed the field. On lap 6, I rode the flats anxiously waiting to see the situation with the leaders near the far-end turnaround. Frankly, I was looking for two struggling riders with a diminishing gap and hoping to see a smaller, charging group within a minute to a minute and a half behind. Happily, I saw but one group of approximately sixteen which represented the fact that the breakaway had now been caught and Inno was now in the lead selection. Now I would have to wait another half lap near the finish line turnaround to see the next update. Video – By Jordan Itaya (Semper Porro Coaching), Erick and Inno’s coach. I continued to ride the course with persisting tempo and could feel my energy dropping, despite the snacks and ongoing fluids. But I was most excited to see the progress of the select bunch. As I got towards the middle pitch of the five-minute climb, I saw my friend in black and red, alone, and with a demeanor of pure business. I smiled and waved my fist in obvious approval of his strike against the field behind him, unseen. I was also happy to see that he had already gained almost a minute on the now smaller group of 10-12 riders. All he had to do was push, there and back, on this course which he has ridden countless times and could do with his eyes closed. I had confidence that he knew exactly when to push hard and when to push harder in order to seal this win for himself and for us. If he failed, I would be content knowing he committed to his best move as did we as a team. But he didn’t fail. In fact, he only picked up more time. The small pack of chasers were not only tired, but unwilling to work together in order to put together the pace needed to catch a very powerful Innokenty. The next I saw him I was barely half way out on my final lap – I was pretty beat but still anxious to see how he was proceeding. As I saw him I yelled for him to take his win because it was his. Then I counted and awaited the chasing field. I was amused and relieved to count beyond a minute and half or so. I knew they had quit on chasing him. He had won. Now I was anxious to get back, finish, and celebrate with my team. I finally arrived later on at the finish to get the inevitable news that Inno had won comfortably. The team rejoiced at our tent and drank Coke with a smile. It was a nice feeling to chat with the other teams’ riders and enjoy the post-race debriefs. It was also fun knowing that we put in a clean team effort to earn our win. We all worked and did our job to set up our best chance of winning. It paid off at San Luis Rey. We are thrilled to have gotten our first victory and now we are focused on using this steam to build more days like this one. It didn’t take long after winding down to quickly look ahead to next weekend. We will see you at Temecula. Thanks for reading my report for our first win of 2016.